*For the best results, prepare the rice before hand and chill. Peel the ginger and garlic. Trim the ends off of the scallions. Finely slice the ginger, garlic, scallions, and chile. Remove the leaves from the cilantro and set to the side. Chop the cilantro stalks finely and add them along with the ginger, garlic, chile, and scallions in a large bowl. Carefully trim the excess fat off of the steak and cut it into finger sized strips. Add the meat and the sesame oil to the bowl and mix thoroughly. Preheat your wok (or a large frying pan) on high heat. Once it is hot, add a splash of peanut oil and swirl it around to evenly coat the pan. Add the contents of the bowl to the wok, making sure the contents do not stick. Stir fry for 2 minutes, taking care to keep everything tossed around evenly so it does not burn. Add the black bean sauce, 1 tablespoon of soy sauce, and the juice from half of a lime. Taste your stir fry and season it additionally with black pepper and/or soy sauce. Remove the pan from heat, transfer your stir fry to another bowl, and cover with aluminum foil. Wipe your wok with a ball of paper towels and put it back on the heat. Add a splash of peanut oil and swirl it around like before. Crack the egg into the pan and add a tablespoon of soy sauce, making sure to stir as the egg will cook very quickly. Once the egg is completely scrambled, stir in the chilled rice. Scrape the sides and bottom of the pan as you go and keep mixing until the rice is hot, a few minutes. Taste and season your rice with soy sauce. Divide the rice between two bowls or plates. Spoon the meat and black bean sauce over the rice. Sprinkle with the cilantro leaves and serve with lime wedges. 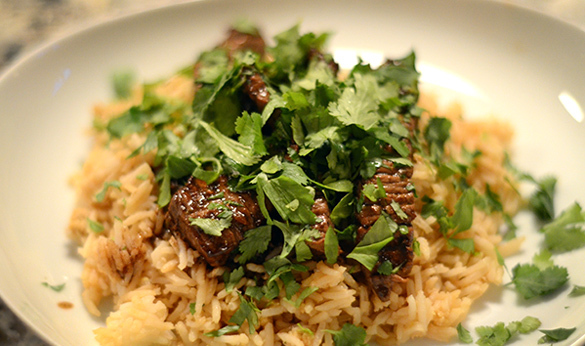 Enjoy this beef with scallions recipe!